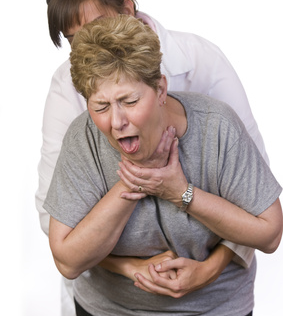 Choking is caused when an object is blocking the throat or windpipe. Adults often choke by large pieces of food, however, children often swallow small toys or other objects. Remember, the universal sign for choking is mimicking choking yourself. Make sure to ask the patient if he/she is choking because, many times, the person is merely coughing. If the patient is unconscious make sure to call 911. Infants 12 months or younger: rest the patient on your forearm (face-down), while also resting your forearm, on your thigh. Perform 5 thumps with the heel of your hand upon the infants back. If the patient is still choking turn the infant over, face-up, and with 2 fingers upon the breastplate perform 5 chest compressions. Repeat the process until the object is lodged. Children and Adults: when performing the Heimlich maneuver make sure to stand behind the person. Lean the person slightly forward and wrap your arms around his/her waist. Next, press hard with a closed fist into the abdomen than grab your fist with your other hand. Perform 5 quick thrusts. If the object still hasn’t cleared the patient's throat/windpipe, repeat the cycle. Unconscious Person: when performing the Heimlich maneuver on an unconscious person lay the patient on his/her back. Make sure to clear the patient’s airway, if needed, finger swipe the patient's mouth to pick out any foreign objects. If you can’t see or can’t take the object out of the patient’s mouth, make sure to perform CPR. Chest compressions will most likely clear the patient’s airway. If you're still unable to clear the patient’s airway and/or if the patient still isn't showing signs of life, make sure to call 911 and continue performing chest compressions. Hypothermia is when the body temperature is below 95 F. Hypothermia occurs when the body loses heat faster than the body can produce energy. Hypothermia often occurs when the body is immersed in cold water. If the patient is left untreated the nervous system will not be able to work properly which will result in organ damage and possibly death. Treatment: Make sure to remove the patient’s wet clothing and replace it with something warm and dry. Make sure to perform rescue breaths if the patient is unconscious. If rescue breaths aren’t accessible make sure to perform chest compressions. If possible, give the patient a warm beverage and a warm, dry compress (hot water in a bag to hold or cover the patient with). Do NOT apply direct heat. Exertional Dehydration — usually dehydration occurs with vigorous exercise in hot and humid environments. Dehydration occurs when you lose fluids more than you take in. If loss fluids aren't replaced dehydration will occur. Treatment: Have patient orally re-hydrate with carbohydrate-electrolyte (CE) drinks. Ingestion of fluids: 5-8% will facilitate hydration. Other drinks: coconut water and 2% milk. Alternatively, if drink aren't available then potable water may be used. Severe Dehydration Treatment: If the patient is severely dehydrated or is in a life-threatening situation activate the EMS. EMS will be able to provide an Intravenous hydration that consists of essential nutrients.